Fall nutrient loading of deciduous forest nursery seedlings is of special interest because of foliage abscission and varied translocation patterns. For non-deciduous seedlings in the nursery, fall fertilization typically can reverse nutrient dilution and possibly increase nutrient reserves; however, this technique has received little attention with deciduous conifer trees that translocate nutrients before abscising foliage. 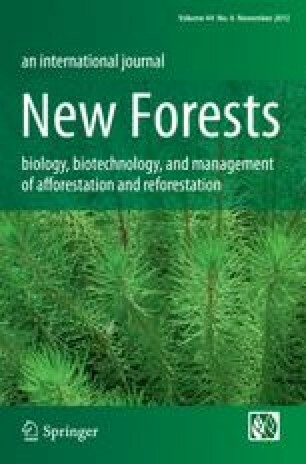 We evaluated how fall nitrogen (N) fertilization affected N storage and translocation in the deciduous conifer Olga Bay larch (Larix olgensis Henry) seedlings during the hardening period. Seedlings were supplied with 25 mg N seedling−1 for 15 weeks before hardening and fall fertilization treatments began with a three week application period of K15NO3 at 0, 5, 10 and 15 mg N seedling−1. During the hardening period, fall N fertilization had little effect on seedling morphology. The N concentration and content of needles decreased dramatically as needles abscised, while that of stems and roots increased. Six weeks after fall N fertilization ceased, all seedlings translocated similar net N from their needles. For the control seedlings, this accounted for 84 % of the N stored in stems and roots. For fall fertilized seedlings, however, the proportion of N stored in stems and roots translocated from needles accounted for only 41–61 % of the total because of absorption of fall fertilizer that was translocated directly to stems and roots. Six weeks after fall fertilization, the distribution pattern of N concentration and content in seedlings was found in this order: stems > fine roots > coarse roots > needles. Our results suggest that providing deciduous conifer seedlings N during hardening, in this case Olga Bay larch, is a way to promote nutrient loading during nursery production. This study was funded by the Fundamental Research Funds for the Central Universities (Contract TD2011-08, JD2011-3) and the USDA Forest Service Rocky Mountain Research Station and the National Center for Reforestation, Nurseries, and Genetics Resources. We sincerely appreciate assistance from Dr. John D. Marshall and Margaret Ward at the University of Idaho Stable Isotope Laboratory; Dr. Deborah Page-Dumroese and Joanne Tirocke at the USDA Forest Service, Rocky Mountain Research Station. We especially thank Associate Editor Dr. Barbara J. Hawkins for her efficient work and valuable suggestions, Editor-in-Chief Dr. Douglass F. Jacobs for the insightful comments, and the anonymous reviewers for valuable comments that improved this manuscript.